The Supervillains performing live at the Beacham Theater, located at 46 North Orange Avenue in Downtown Orlando, Florida, on November 21, 2012. 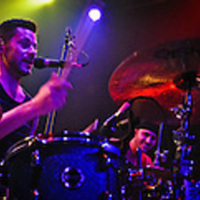 The first and second photographs feature, from left to right, drummer/vocalist Dominic Maresco and bassist Daniel Grundorf. 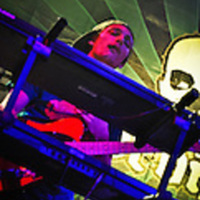 The third photograph shows keyboardist/guitarist Tom "T-Rex" Moulton. The Supervillains were formed in 1998 by drummer/vocalist Dominic Maresco and guitarist/vocalist Scott "Skart" Suldo, while they were in high school in St. Cloud, Florida. Initially a punk-rock band, the group adapted elements of ska and reggae to their sound, leading to opportunities to support reggae acts such as The Wailers and Inner Circle, reggae-rock acts such as Slightly Stoopid and Pepper, ska acts such as Reel Big Fish and Streetlight Manifesto, punk acts such as Pennywise and Authority Zero, and rock acts such as Fishbone and 311. 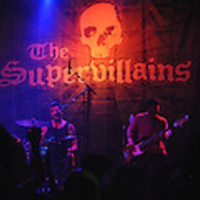 After several successful tours as an opening band, The Supervillains began headlining their own national tours, often performing over 200 shows per year, and released eight studio albums as of June 2015. The band incorporated several horn players and other members for eight or nine years, but have since operated as a four-piece, with Maresco, Suldo, Daniel Grundrof on bass and Tom "T-Rex" Moulton on keyboards and guitar. After selling over 100,000 records, the group formed their own label, Rah Rah Rah Records, in 2011. Original color photograph by Alicia Lyman, November 21, 2012: Archive: Concerts Archive, Alicia Lyman. Lyman, Alicia. “The Supervillains at the Beacham Theater, 2012.” RICHES of Central Florida accessed April 24, 2019, https://richesmi.cah.ucf.edu/omeka/items/show/5304.